Alan Gouk: Some Notes on Three Exhibitions in London. 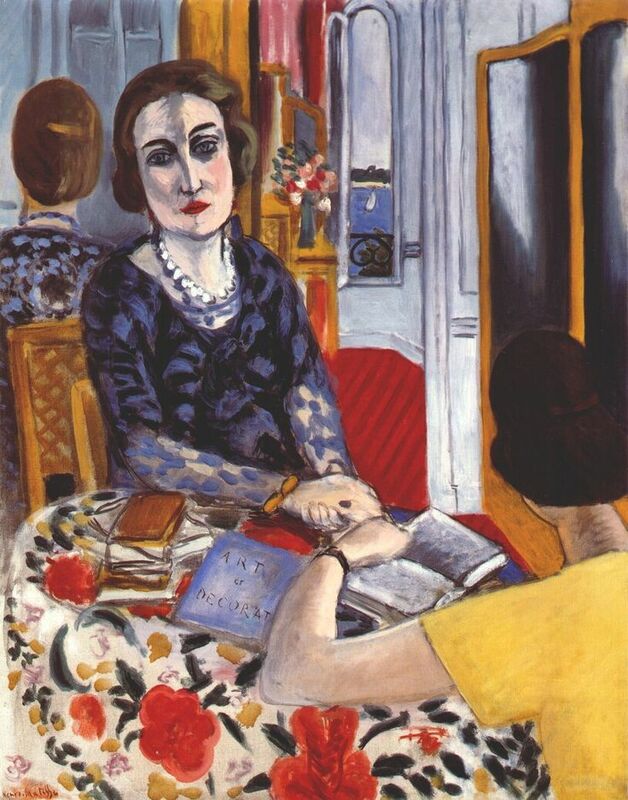 Cezanne, Matisse, Soutine. The show of Cézanne portraits at the NPG is so overwhelming that I’m obliged to confine my response to just three or four pictures. As with the Rembrandt exhibition at the National Gallery in 2015 one feels that everything that could possibly be said has already been said, and yet nothing has been said that comes near to conveying the qualities of original vision and formal power of these masters, and the formidable (in the French pronunciation) humanity of their affirmation of painting’s capacity to “take the impress of spirit” in the words of Roger Fry. 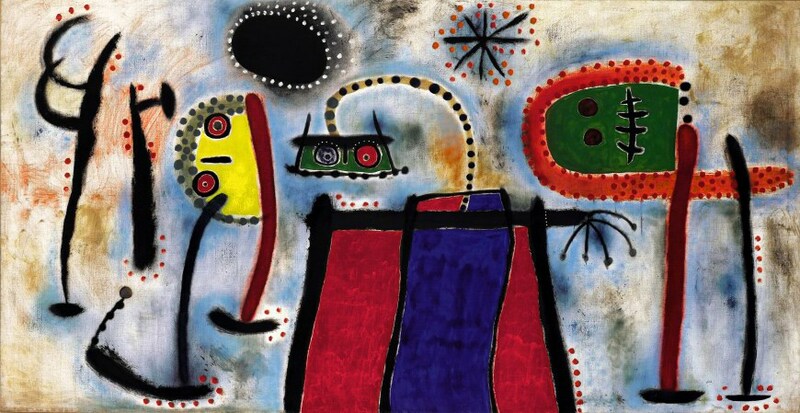 Painting will never be “dead” as long as one can take sustenance from pictures like these. 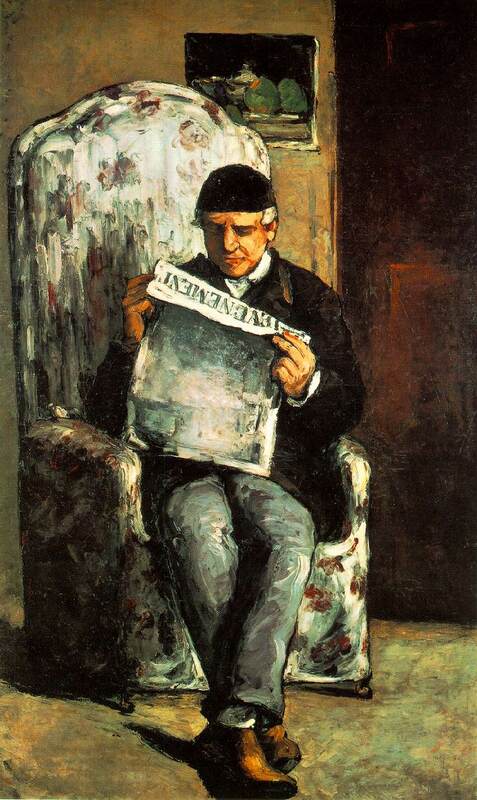 The resounding “bass vibrato” of the young Cézanne’s temperamental brutalism is struck by the first painting one sees on entry, the large vertical The Artist’s Father 1866. The volumetric relief of this seated man is astonishing, his legs and feet jutting forcefully into the foreground space, swollen like an elephant’s, rendered clumsily in a smoothly succulent and absolute grey, with emphatic shadows that are consistently maintained throughout on the heavy throne-like chair which is modelled with the same fluent clumsiness as the figure of the father, who looks more like a labourer than a banker, his podgy hands clutching L’Événement newspaper, hewn with much scrapings in white/grey/black like a Mosaic tablet. Whether this brutalism was intended as a rebuke to, or an assault on the seamless trompe-l’oeil finesses of Salon favourites, or whether it was the best that Cézanne could manage at this juncture, is no matter, and what it says about his relationship with his father must remain forever prurient speculation. To me if anything it seems to heroicise him. After all it was his father’s largesse that enabled Cézanne to dedicate his life to a sustained concentration on painting that was denied to most of his companions. The buttery fat palette knifing sculpting the father’s face and hands is echoed in many portraits to follow, of Uncle Dominique and others, which in spite of this limited means, manage an extraordinary salience of volumetric form reduced to the extremes of light and dark (black hat and white gloves placed near the painting to serve as the outer limits of the pendular swing of their tonal language.) The solidity and succulence of paint application in this painting would be subject to transmutation with a thousand nuances over the years, near glazes replacing impasto, in which the watercolours are a crucial accompaniment, re-emerging in the very late portraits with a renewed if symphonic solidity. 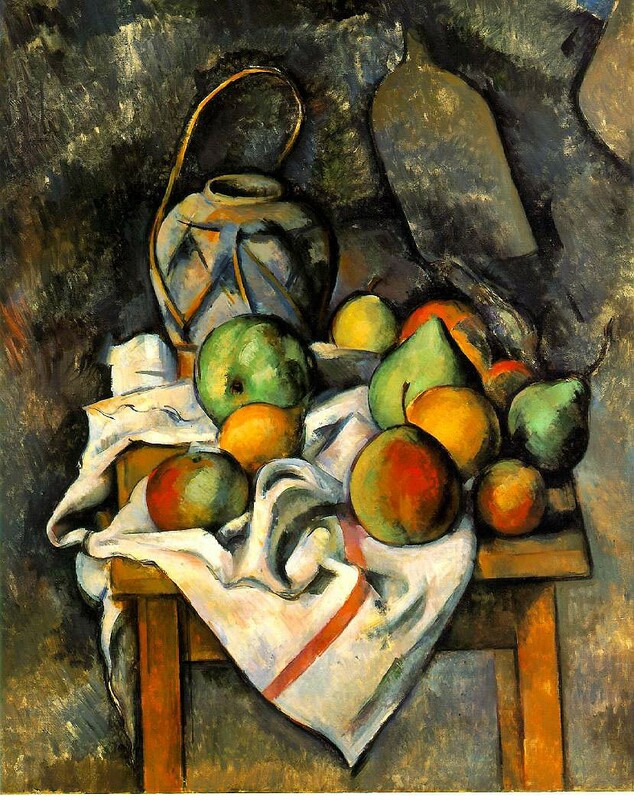 But The Artist’s Father has further indices of the inherent tendency of Cézanne’s art, in the dense chocolate brown plane and the sienna wall plane that backs up the chair, with a still-life painting in a style influenced by Monticelli, who was also a palette knifer, hanging behind the head, parallel to the picture plane; in all of which Cezanne seems to want to outdo Manet in “bold impasto” and the emphatic assertion of the planarity of the picture design. The Shchukin Collection at Fondation Louis Vuitton, Paris has been extended to 5th March 2017. This unmissable show is likely to be the highlight of this year and possibly of the decade. The flamboyant kite-like superstructure in Frank Gehry’s signature style apart, the main galleries display beautifully the visionary taste and judgement of this extraordinary Russian collector. What monstrosities may we expect when this show closes? Gerhard Richter? Cy Twombly? Bill Viola? Ai Wei Wei? God help us! So let us rejoice while we can that there once was a man of superlative judgement to take the true temperature of his times, a time before the psychopathology of art globalisation. This is an exhibition that normally would have gone to the Met. or the National Gallery. How many handbag sales have gone into this colossally expensive enterprise on the fringes of the Bois De Boulogne? Katherine Gili: Looking for the Physical was at Felix and Spear, Ealing, London, 10th November – 13th December 2016. 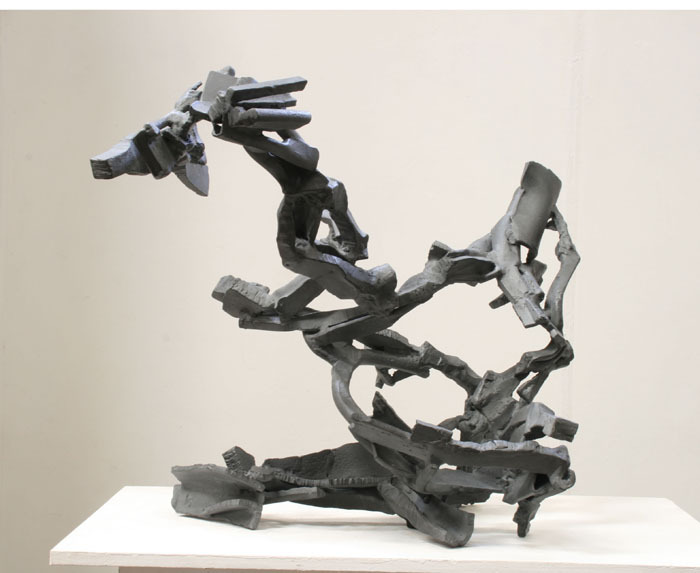 The sculptural power of Leonide, 1981-82, as it thrusts into space, to go no further back in Gili’s oeuvre, is clear affirmation that sculpture whose aim is to engage one immediately in a spatial way rather than having a predominant viewing point, does not need to do so equally from all points on the compass. Considered as an analogue for a structure, (with its figurative connotations in abeyance for the moment) its “stance” is forthright and unambiguous. It has remarkable physical presence from wherever it is viewed. It IS – it exists as an object in space, articulate and articulated, self-assertive and self-justifying (though that’s not all that it is). Each element is clearly defined in character and in its structural role. And it seems to say something about Gili herself, an enduring strength of character and artistic identity, proving that the unconscious reveals itself more through arduous realisation and reflection, than through perceptual self-trickery or doodling. It makes Giacometti for instance look very feeble indeed. The fact that its structure is also a representation, if at some remove, of a body in movement allows one to accept without demur that it is anchored to a base and cantilevered from there. 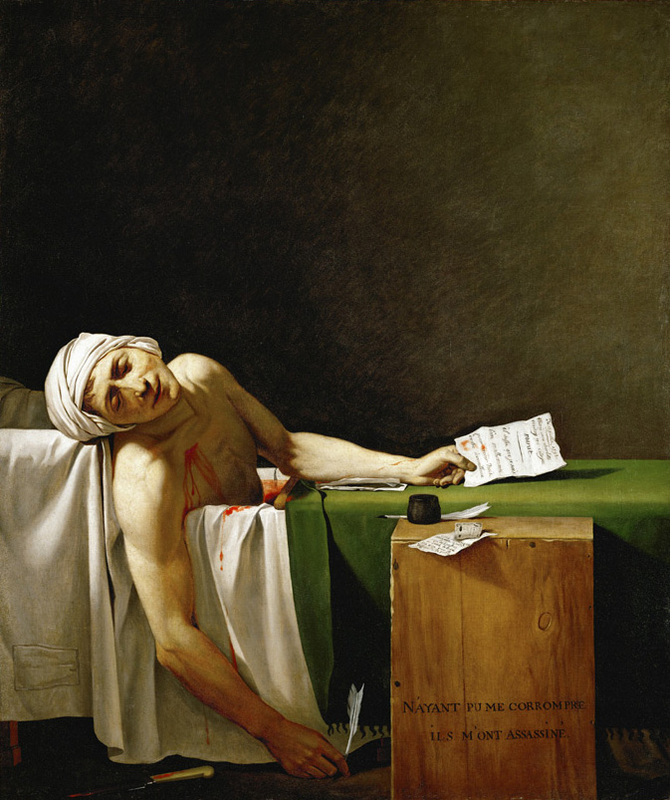 Jacques-Louis David, “The Death of Marat”, 1793. “An institutionalised counterculture condemns individuality as archaic and depreciates intellectual values, even in the universities.” Harold Bloom “The Anarchy of Influence”, 2011. “Literature is always personal, always one man’s vision of the world, one man’s experience, and it can only be popular when men are ready to welcome the visions of others. A community that is opinion-ridden, even when these opinions are in themselves noble, is likely to put its creative minds into some sort of prison….” W.B. Yeats, 1904. “Only that which does not teach, which does not cry out, which does not persuade, which does not condescend, which does not explain, is irresistible.” W.B. Yeats, 1910. In one of the last “crits” I took part in before quitting St. Martins in 1990, a hapless student, when asked what he thought he was doing in presenting a large blown-up photograph of the Royal Family on the balcony of Buckingham Palace underneath which there ran a Silk-Cut purple band with some trite non-sequitur of a written slogan, rather like the tapestries partially glimpsable behind the chair of committee hearings at Portcullis House, said student in his defence offered the banal: “I want to manipulate, seduce, and control”. I was quite unaware at the time (why should I have been?) that in doing so he was quoting verbatim the sayings of one Jeff Koons, who was becoming – had already become – one of the reference points for any aspirant fashionista of the day. “Manipulate, seduce, and control”… there’s a lot of it about; indeed for a Marxist or lapsed neo-marxist or pseudo-marxist critic, that’s all there is. For Terry Eagleton, whose book “Literary Theory” I stumbled across in my local Oxfam shop, there is no such thing as literature, only what many readers feel inclined in their delusional subjectivity to read; literary criticism has therefore no reason to be, and should be replaced by the study of rhetoric, or the diabolic arts of persuasion, the strategies by which writers dupe the reader into the illusion that their fantasies of coherence and “liberal-humanist” epiphanies offer consolation from the brute realities of power. Here the paranoidal suspicion so beloved of the perpetual adolescent that all utterances are irremediably riven with endorsements of the prevailing world order, complicit in the structures of mind control which support it, and that all art is a policing of experience, corralling it in ways supportive of the oppressive ”father”, is given the seductive lure of an outré cult of transgression, with sexual-political undertones backed up by an assumption of intellectual pedigree that goes all the way back to G.W.F. Hegel, and K. Marx in his Hegel influenced period. It is always best to read such books as Eagleton’s and T.J. Clark’s (I’ll come to him soon) backwards from conclusion to introduction, to reveal just how fatuously inadequate are their solutions to the problems they claim to have discerned through their critiques.